Up until age 7, Ella Ewing was a perfectly ordinary farm girl from around La Grange, Missouri. Then she started to grow. By the time she was 14 years old, she was over six feet tall. By 18, she was close to seven feet. Her ultimate height, which she reached at age 22, is believed to have been eight feet, four inches. Round about the time she reached that mark, the world began to take notice of Ella. Unfortunately for the world, Ella preferred to be left alone. The idea of celebrity clashed with her extremely pious Christian beliefs. What’s more, she was self-conscious about her height, and uncomfortable with the idea of people gawking at her. But in 1892, when the Chicago Museum offered Ella $1,000 to spend four weeks as one of their exhibits, she finally relented. What made her change her mind? Furniture. Fame and fortune meant absolutely nothing to Ella. Her daydreams were filled with custom-made oversized beds and rocking chairs, on which she could finally rest comfortably. She also realized how much the money could change the hardscrabble lives of her aging parents. From the museum gig, Ella went on to the World’s Fair in Chicago, and later became a headliner for the Barnum and Bailey Circus. 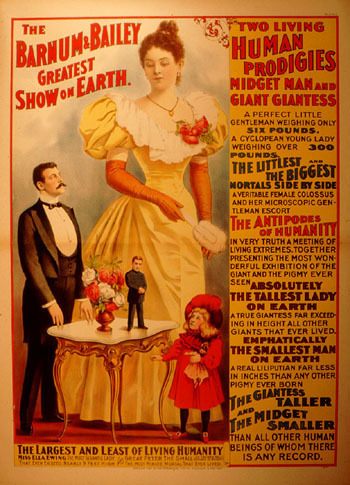 “The Missouri Giantess” also had stints touring with the Ringling Brothers Circus and Buffalo Bill’s Wild West Show. The money rolled in, and soon Ella could afford all the massive furniture she wanted. She bought her family a new farm, near Gorin, Missouri, and had a house constructed to match her dimensions, so that she’d never have to stoop again. By 1910, Ella began to feel the weight of her frame. She retired from show business, and spent her last few years peacefully at home. She died in 1913, of tuberculosis. Ella had requested to be cremated, fearing her bones would be put on exhibit after she was gone. But her father couldn’t bear the thought, and instead placed her casket into a steel vault, which was encased with cement. 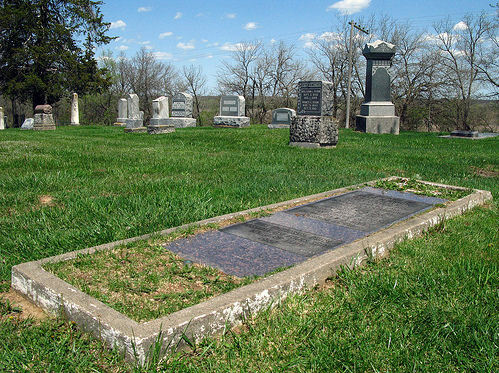 Ella's Grave Near Gorin, Mo. Ella’s house burned in 1965, but you can still visit her well-fortified grave in Harmony Grove Cemetery, near Gorin. Some of Ella’s furniture, clothing, and other possessions are on display at the nearby Downing House Museum in Memphis, Missouri. Ella is also the subject of a recent children’s book by Missouri author Kate Klise. The Missouri State Museum in Jefferson City has a couple pairs of Ella’s shoes that came from her shoemaker. What are the dimensions of the shoes? I READ THE ARTICLE ABOUT MISS EWING AND I STILL WONDER WHY THEY NEVER PRINT THE TRUTH ABOUT WHO BURNT HER HOUSE. AT THE TIME EVERYBODY KNEW WHO IT WAS BUT MANY PEOPLE WERE AFRAID OF THIS PERSON AND HIS PARENTS SUPPOSEDLY HAD SOME INFLUENCE IN THE TOWN. THEY OWNED A CAR DEALERSHIP IN TOWN, MEMPHIS MO, WHICH IS NO LONGER IN TOWN. THE LAW WAS ALSO AFRAID OF HIM. I would like to know more about your comment. I am related to Ella and can only find bits and pieces of information about her. it is also to bad that joe Buford isn’t alive still because nobody knew as much about her than he did. I’m related to Ella Ewing too. We are Sprouse-Ewings. who are some other family names?